My Kids Stole My Brain: Do your kids do this? Introducing the THUMB PICTURE BOMB! So Jake has invented an all-new version of the picture bomb - he couldn't get his whole body in the picture, so he figured a THUMB would do the trick. So introducing, for the first-time ever on a blog, the world's first THUMB PICTURE BOMB. He completely cracks me up! 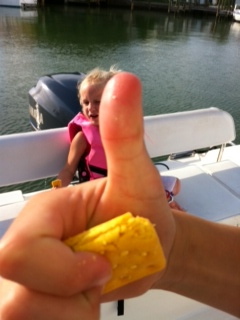 If you're wondering, that's a cheese cracker in this hand, it never did make it into his mouth, mostly just scattered around the boat when I swatted his hand out of the way it broke apart in his hand. I would love to see some of your funny KID pics - please share and make sure to SUBSCRIBE to my blog!